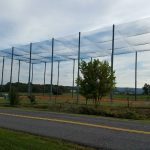 We design, engineer and supply a wide variety of nets, netting systems and enclosures for sports, commercial and industrial applications in the U.S. and abroad. Our sports barrier netting installations can be found all over the US, Canada and abroad. Our structures withstand the test of time and environmental elements like no other. Invest in the best sports netting and lighting installations, the largest and longest standing structures around. Covered by a full comprehensive warranty. 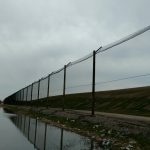 Order custom-cut barrier netting for your specific needs. Baseball netting, golf netting, backyard sports netting, accessories and more! If you need something and don’t see it in our store send us a message and let us know! We have a large variety of custom netting options for many different applications. 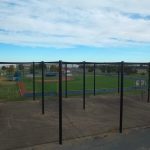 Here are some examples: custom batting cage nets, baseball backstop netting, softball netting, strong netting, custom batting cage netting, security fence netting, sports netting repair, commercial golf nets, custom golf nets, custom soccer netting, golf range netting, etc. 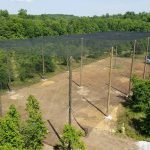 Batting Cages, UAV Enclosures (Drone Enclosures), Driving Range, Canopies, Trash and Material Containment Enclosures, Overhead Netting. We can build you a custom enclosure at any desired height (20′ up to 200′ or above). 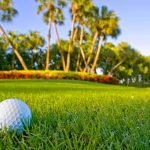 The installation of the poles and net on the Baha Mar golf course driving range has been a complete success, and I must command your crew for doing an incredible job, in record time, with no disruption to the existing grounds. Shawn and Adam were great to work with, and what was supposed to take 5 or 6 days to complete was done in 3 days. The client at Baha Mar has expressed his great satisfaction about the quality of the workmanship and the rapidity of the work execution. We will certainly be contacting Golf Range Netting for our future netting projects. CHRIS LECLERC, Classic Golf Bahamas. Ltd.
Great job! Crew was amazing. Really appreciate good workmanship. Fantastic work and completed much quicker than expected. Netting system is awesome! Done right and done quick! Will recommend to everyone I know!! 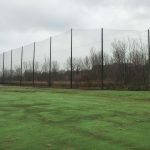 Golf Range Netting (GRN) completed our job exactly as stated, right on time and as quoted. Shawn and his crew got to our site early and left late each day. The entire netting system is very secure without any slack anywhere. They carefully fit each panel exactly for a very professional look. 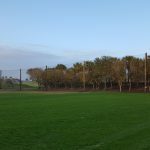 GRN also worked with us to complete repairs on existing netting to extend the life. In a short time, they got everything looking like new. I highly recommend Golf Range Netting. 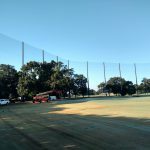 I can't say enough about the quality of work and professionalism provided by Golf Range Netting from start to finish of our project here at Eagle Creek Golf and Country Club. 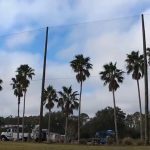 Post-Hurricane Irma our driving range net and poles were in disarray, and the condominiums on the other side of the net were left unprotected. 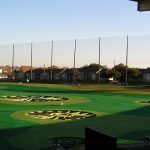 We needed a new structure in a timely manner and Golf Range Netting did not disappoint. Between the outstanding communication with the office staff and dedication to quality from the install crew, we could not be happier with the result. We have received many positive complements on the netting structure from our members, and I know the condominium owners feel much safer with the improved protection from the impressive structure. 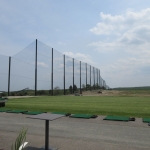 I would recommend Golf Range Netting, with full confidence. to meet and exceed your expectations by providing first class communication, quality, and craftsmanship. Very happy with the job. Vinny and Dan were real professionals and a pleasure to work with. A very nice job, they spent extra time to make it right. I just walked the new net with your crew and I am very happy. I have worked with many contractors over the years and it is not often that one does exactly what they say and stays to their schedule. You should be proud of the crew you sent here as they were ALL very professional and efficient. We survived Hurricane Sandy! High winds in the immediate area knocked out power in for 4+ days. Many trees were blown over. The poles you set and the driving range netting survived without incident. I will be happy to be a reference if needed. This company is very professional and lived up to all their commitments and did a great job. They are very competitive and did extremely quality work. I would definitely use them in the future for additional work and would strongly recommend them to all. 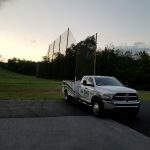 Based upon my experience now with Golf Range Netting versus the others, I would strongly recommend going with Mark as he delivers a “one-stop-shop” product and is much better at tailoring the netting to your specific needs. The crew was very professional & knowledgeable. Sean (Superintendent) walked us through the entire process. 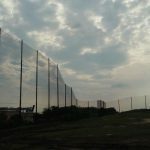 Golf Range Netting is a top notch, economical, friendly, and efficient company for protective netting solutions. Mark Ramsay quoted the netting backstop for the University of Charleston at 40% less than the best quote that I had received and he also increased the height of the net by ten feet. We ended up with a better product for much less money and an unheard of seven year warranty. The project was completed in only four days and the crew was friendly, very professional, and extremely efficient. Though they didn’t have to, the Golf Range Crew jumped in and helped my crew remove the old backstop. 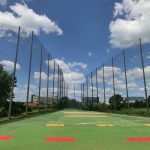 I highly recommend Golf Range Netting! Guys were very professional. On time every morning. Went above & beyond. I do not write letters like this often but I feel this is necessary. Working with Shawn and Vince was 100% my pleasure. 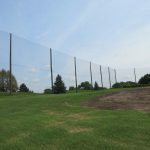 The LiRo Group will highly recommend Golf Range Netting for any future projects. Feel free to use me as a reference. 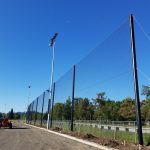 We have over 25 years in the Sports Industry, and over 170 years combined experience developing and installing custom netting structures and sports lighting solutions for a variety of applications. We design, engineer, manufacture and install, durable, practically invisible, maintenance-free netting systems and lighting. 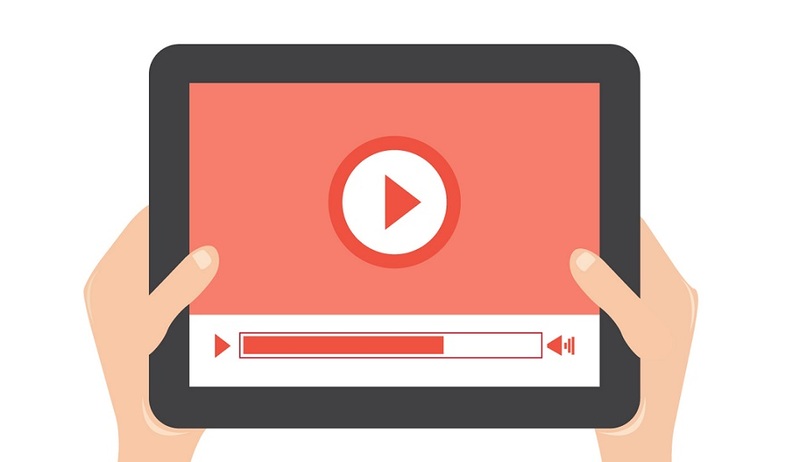 Every project is different, we do not provide “one-size-fits-all” or “out-of-the-box” systems. When we arrive at your facility, we perform an inspection that helps us determine what solution works best for you and your needs. 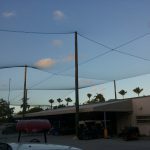 We will design and engineer a durable, cost-effective netting solution, that will reduce your liability – guaranteed. Despite our name, we are not limited to Golf Netting. We develop superior netting solutions for any application that fits your needs – we accommodate sports teams and facilities, commercial and industrial properties, as well as individual sales. Our nets are made from the highest quality materials available for superior durability to withstand the harsh elements of any environment. Our structures are designed, engineered and installed in-house, by experienced, certified structural engineers and crew members.